First game of the new season for the Newark Seconds, against a well-trained and well-organised Derby development squad a couple of leagues above them in this inter-county friendly. The visitors kept Newark pinned in their own half for most of the first quarter of the game, recycling the ball well and using their big strike runners to hunt for gaps in the line. To their credit, the home side kept their shape well during this initial period, but it was not until 15 minutes in that they constructed their first attack, winning scrappy ball at the breakdown and forcing Derby to concede a penalty and an attacking line-out on their 5m line. Newark were unlucky to lose the ball forward in the resulting maul, leading to a Derby scrum which the visitors used to settle themselves and launch a searing attack down the left, ultimately leading to the first touchdown of the game 0-5. This was to be the pattern for the rest of the half, with a tactically dominant Derby forcing the Newark defence to over-commit and create gaps and overlaps for their exciting back line to exploit. By the break, and despite some excellent work in the loose by the home forwards, the visitors had scored 6 unanswered tries, 4 converted - 0-38. Whilst Newark struggled throughout the game at both scrum and line-out against a far more drilled outfit, they had noted that if Derby had any area of weakness, it was at the breakdown and the home side did start to exploit this during the second half, clearing out well and looking dangerous in possession. Nonetheless the visitors had scored another 3 times in quick succession, before the Newark lads managed to breach the Derby line in the burly shape of second row Matt Gibson during 10 minutes of sustained ferocity on the Derby line - 57-5. 10 minutes later, and after a despairing last ditch high tackle had sent a Derby player to the sin bin and deprived the home side of a certain try, Newark scored again with Alex Jackson muscling over to score left of the posts 57-12 (conv. Rhys Overland). Newark were clearly up for more, scrapping their way up the pitch again from the restart, but found themselves unable to recover the ball from a maul, and Derby used the resulting scrum and some excellent sleight of hand to ship the ball wide and score right with a length of the pitch move, following this up with two further breakaway tries in as many minutes - 12-76 final score. 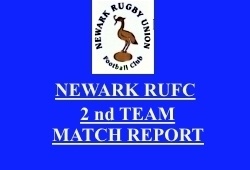 Despite an unflattering scoreline, this was a hugely committed performance by a scratch Newark 2nds against a side which would frankly have put points on any team Newark cared to put out. Credit goes to all who took part, often out of position, and great to see colt Jacob Pearson rumbling on and making an impact in the second half. Plenty to work on - but they don't come tougher than this.